Füchse Berlin were seven goals down more than once when they played way against Lugi HF on Thursday evening, but they pulled off a spectacular comeback to take their first win in the EHF Cup Group Phase. 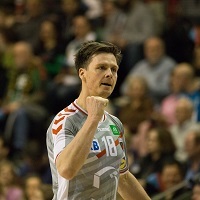 Füchse were missing right back and German international Fabian Wiede, who was nursing shoulder problems, but that did not keep the number two side in the Bundesliga from taking their first win in the EHF Cup 2017/18. However, Füchse had to work hard for the two points, which they did not secure until the last minutes. After an equal start, Lugi soon claimed the upper hand, as they turned a 6:5 lead into 10:5, then 14:7, holding a clear advantage for a significant part of the match thanks to a stellar performance from Josip Cavar. The goalkeeper’s save rate was no less than 60 per cent in the first half. It was mainly due to the right side of their attack, with Mattias Zachrisson on the back and Hans Lindberg on the wing, that the visitors managed to reduce the gap before half-time. With greater experience, more physical strength and a deeper roster, Füchse continued minimising the difference in the second half. With 12 minutes left, their Danish line player Johan Koch equalised at 22:22, and two minutes later Hans Lindberg scored a penalty to take the visitors in front 23:22. Lugi managed to reclaim a one-goal advantage more than once, but Füchse were in control for the rest of the match. Both teams’ right wings were their top scorers, as Lindberg tallied 11 goals for Füchse, while Hampus Jildenbäck contributed eight for Lugi.